Bo Branding & Design Ltd. If being cool means standing in a sea of conformity, then the three Montreal-based entrepreneurial bright minds behind Canada’s first national brand of low-calorie ice cream are true masters of the big chill. Launched a little less than a year ago, the aptly named CoolWay range of ice cream is nothing less than a dream come true for countless Canadian consumers who love the taste of high-quality ice cream but dread the high calorie count and fat intake associated with one of the world’s most popular and universally beloved desserts. Developed as a “guilt-free” alternative to conventional ice cream products by long-time buddies Benjamine Outmezguine, Noah Bernett and Dino Vassiliou, CoolWay ice-cream is actually a triumphant remake of the trio’s earlier creation called CoolWhey, which was high-protein frozen dairy treat intended for sale at fitness centers, health clubs and vitamin stores as a post-workout supplement. While that product received a fair bit of media attention and notoriety with the founders’ appearance on the popular Dragon’s Den television series of the Canadian Broadcasting Corporation (CBC), the costs and logistics of making in it widely available in its intended frozen format at limited points-of-sale put breaks on further market development. 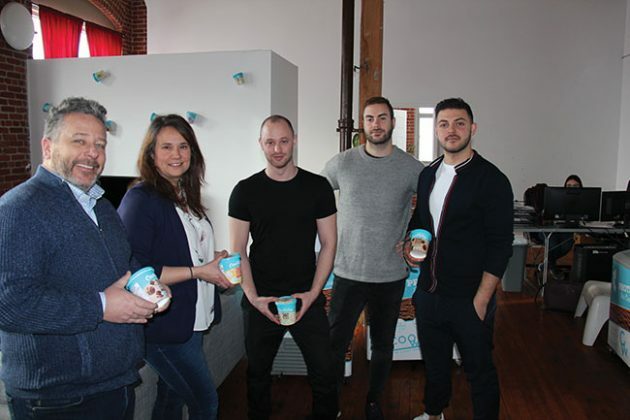 From Left: Bo Branding & Design president Marc Beauregrad and project manager Hélène Maillé strike a pose alongside CoolWay co-founders Noah Bernett, Benjamine Outmezguine and Dino Vassilou, whose low-calorie ice-cream product is quickly becoming a hit across Canada, in part thanks to the inspired packaging design work executed by Montreal-based Bo Branding. Undaunted, the three company founders turned the initial setback into an opportunity by reformulating their product to appeal to a far larger mainstream audience, while retaining the product’s high protein content. 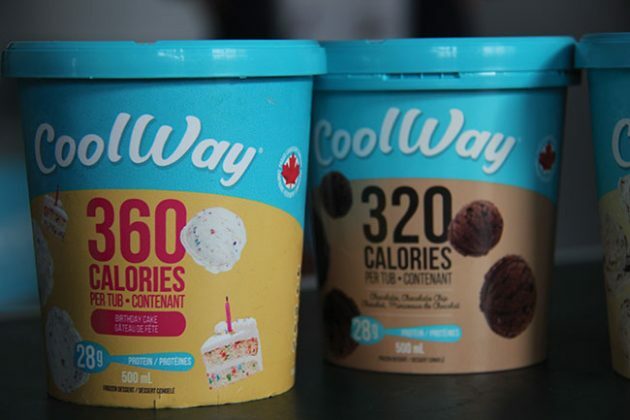 “But we quickly realized through in-store demos that the mainstream market was mostly interested in the low-calorie aspect of our products,” CoolWay co-founder Benjamine Outmezguine told Canadian Packaging in a recent interview. 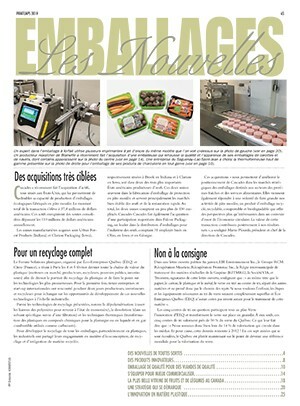 “That’s when we asked Richard, our product developer and partner, to go back in the kitchen and come up with the best-tasting low-calorie ice cream he could possibly make,” says Outmezguine, noting it took about nine months of intense product development to obtain the right texture and taste profile, along with remarkably low calorie count. 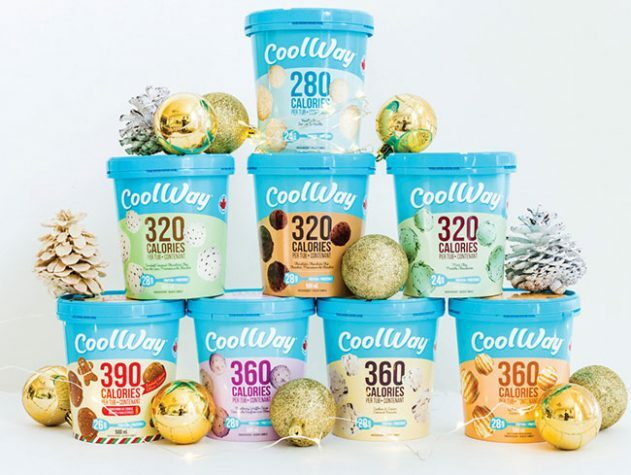 Already retailing across Canada in seven different flavors, the CoolWay brand contains only 280 to 360 calories per a full 500-ml “pint” tub—a stunningly low total that is proudly displayed as a primary graphic on each of the brand’s different flavors in the center of the cylindrical tubs. Produced in strict accordance to CoolWay’s safeguarded recipe, the novel ice-cream also packs 28 grams of protein and a healthy helping of fiber in each 500-ml tub, while containing 50 per cent less sugar than most established ice cream brands in the market. Offering one-year shelf-life, the CoolWay brand has been quickly picked up by leading national grocers such as in Walmart, Metro, IGA and Whole Foods, among others, where its cheerful light-blue package design adorned with playful graphics of ice cream scoops floating in mid-air has made a huge impact with the consumers. “The ice cream category is a very competitive space where big companies spend big bucks to remain on the shelves, as well as on advertising Outmezguine states. Says Outmezguine: “Before launching the CoolWay brand, we knew that we were onto something special and that we needed very strong packaging to communicate the right messages to consumers. 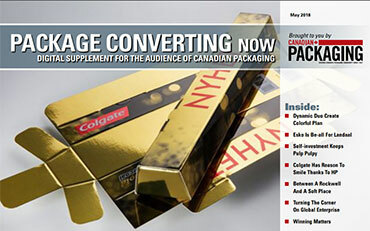 To get the packaging and story-telling just right, CoolWay approached Montreal-based packaged deign and branding services specialists Bo Branding & Design Ltd., which has built up an impressive body of work over the years for multiple clients in the dairy and other CPG (consumer packaged goods) industries. “After looking at Bo Branding’s impressive portfolio, we knew that they were the right partner to create something truly special for us,” Outmezguine relates. 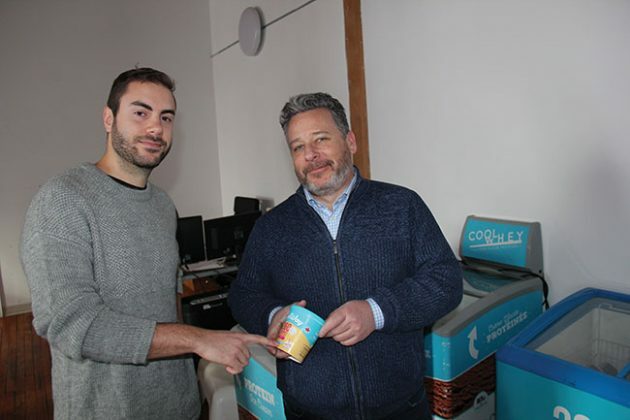 CoolWay co-founder Benjamine Outmezguine (left) says he was so impressed by the high quality of packaged design work done by Marc Beauregard (right) and his Bo Branding team for his brand’s 500-ml pint tubs that he also selected the agency to design packaging for the company’s new range of frozen bars that it plans to launch across Canada later this year. up the product’s health attributes in light-hearted style with clean, engaging graphics and fonts. “The keywords that we used at the start of the project were ‘indulgent,’ ‘calorie-focused,’ and ‘blue,’ which was the legacy color from our previous brand,” Outmezguine explains. “We went with our legacy blue (Pantone 3115 C for life) from our previous CoolWhey brand because it’s friendly, approachable, and also one of our trademarks,” he states. “It also has this pastel nostalgic feel to it. 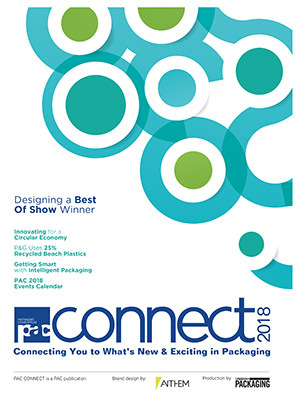 As he recalls, “The consumers and our clients loved CoolWay’s packaging from the first day we announced it! “It is blue, it is approachable and, above all, it is fun,” Outmezguine extols, while also crediting the company’s packaging supplier Stanpac of Smithville, Ont., for exemplary service in supplying the sturdy, fully-recyclable paperboard pint tubs and plastic lidding incorporating tamper-evident safety seals. All in all, Outmezguine says he was highly impressed with Bo Branding’s professionalism and creativity that are aptly reflected in the final packaging execution. 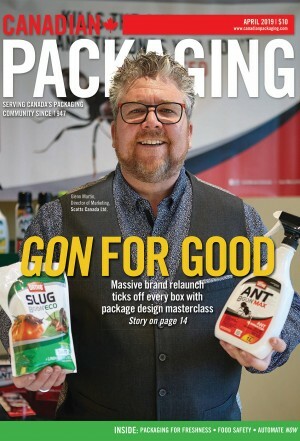 “It’s never easy to create new packaging in Canada,” he says, “due to the unique challenges that we face because of the two-language (English and French) requirements. “But with Bo being a local [Montreal-based] agency, they are very familiar with the process and all the best practices. Says Outmezguine: “Bo Branding handled our packaging from A to Z and they did an amazing job… we could not be happier with the result. “The entire process was a pleasure—they always listened well to our feedback, acted quickly to respond, and they have great taste and,” he quips. “If I had to rate their success, I’d give them a solid 10 out of 10,” says Outmezguine, adding that CoolWay has also recently engaged Bo Branding to develop packaging for the new range of CoolWay ice cream bars that the company plans to launch in Canada later this year, along with seven new flavor varieties. As Outmezguine sums up, “When you compete in the CPG space, your product is everything: taste first and packaging second. “In this light, the packaging created for us by Bo Branding is a big contributor to our success to date,” he states, “and I think it has successfully set the tone for our branding going forward. 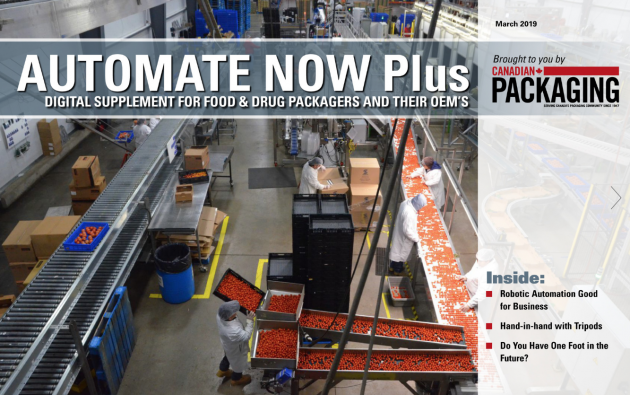 “We plan to use this structure for all CoolWay’s future products and innovations,” he says, “because it really stands out in the freezer and it’s great at creating brand uniqueness and loyalty. “We don’t go plan to go for the conservative corporate look simply because that is not who we are,” Outmezguine concludes.